← A Very Barney Christmas to You All! Don’t you see? The rest of the country looks upon New York like we’re left-wing, communist, Jewish, homosexual pornographers? I think of us that way sometimes and I live here. Of course, that’s Alvy Singer talking, Woody Allen’s character in Annie Hall. When I’d watch that film as a high school student in South Jersey, longing to move north, that line made more of an impression on me than others in the film (which is saying a lot). None of those labels (communist, Jewish, etc.) applied to me, but being an outsider in high school, I certainly knew the feeling of being labeled and mislabeled. I expected this didn’t seem so farfetched a sight to the rest of the world, because as they all know (or imagine), it’s commonplace for New York City subway passengers to point semi-automatic rifles at a mother and her children, right? By Game 6, the Yankees had won three games, and the LA Dodgers had won two. 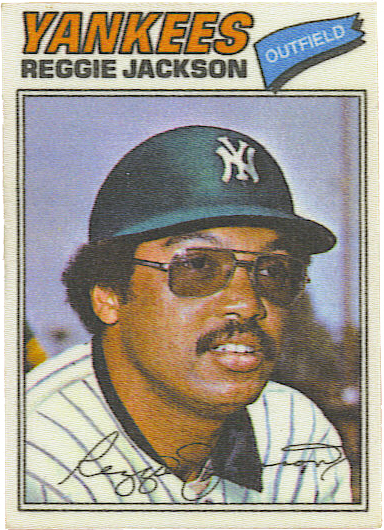 That night, Reggie Jackson made history by hitting 3 home runs, in 3 consecutive times at bat, in only 3 pitches, off 3 different pitchers. (Un-believable.) His last was in the 8th inning, and when he took the field in the top of the 9th, the Yankee fans were bloodthirsty for victory and couldn’t contain themselves. 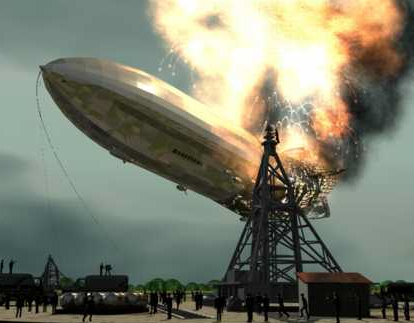 Even though security had been quadrupled, it wasn’t enough: some over-enthused fans threw firecrackers towards Reggie in right field, forcing him to take drastic measures. 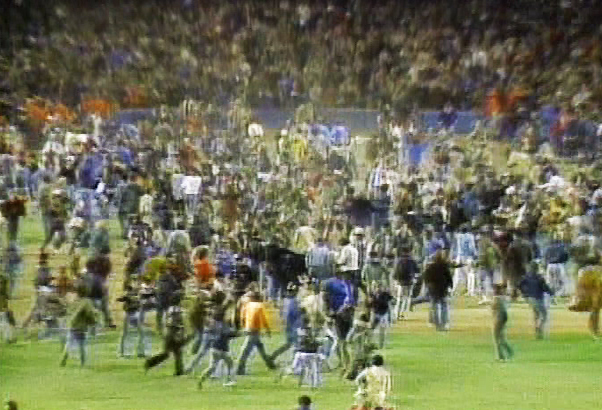 Now I’ve seen plenty of footage of World Series victories: players jumping on each other, fans storming the fields, and so on. But this clip is seriously fucked up. It’s not so much like “The Giants win the Pennant! The Giants win the Pennant! 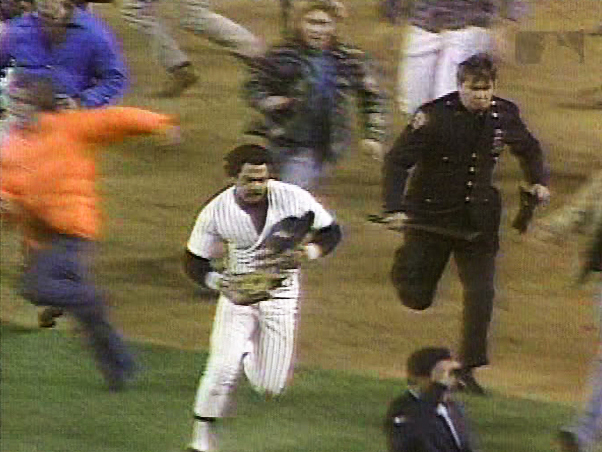 !” as it is “Oh, the humanity!” Cops with raised nightsticks, kicking fans on the ground; a cloud of dust rising above the melee; and poor Reggie Jackson running for his life, bodyslamming New Yorkers. I always thought the crowd gathered outside of the bank in ‘Dog Day Afternoon’ was a great and faithful representation of the era. Yes, it has real energy, like wartime cameramen with tripods and video cameras. They seem to grasp the insanity of it all. And, Hell, that camera following Reggie is doubly amazing since who would have any idea Reggie’s action would be to run OFF the field (as opposed to running to the safety of a pile of Yankees around the pitcher’s mound. Amazing to watch Reggie – like a running back – sizing up the crowd, then bulling his way into them and around them – never understood why he took off his helmet at that point, though. That helmet would have helped, right? I love that he saves his glasses, too. I expect he relied on his athletic prowess as much at that moment as he did at the plate in innings 4, 5 & 8. The only explanation I can come up with is the firecrackers confused him and he thought he was returning a kickoff for the N.Y. Giants. Note the expert cradling of the helmet under his arm. 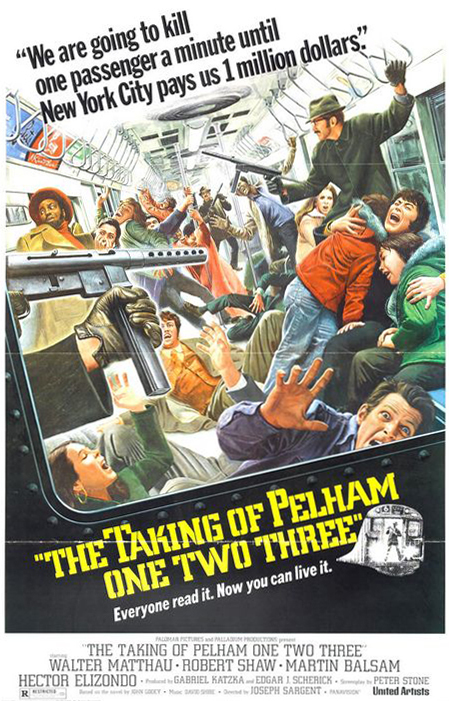 for a moment i thought the reggie footage was a clip from pelham 1-2-3 of a out of control subway train careening down the tracks. man o man! that’s a performance you’d never see if reggie had been FROM new york. he looked like a real out of towner there. OK, watched it again… did you notice the cartwheel, just to top it off? Yes. It reminds me of the last scene of Brewster McCloud. BTW, New York Magazine just ranked Dog Day Afternoon pretty high on their list of quintessential New York films.